South Boston was originally part of Dorchester, and was annexed by the City of Boston in 1804. Omnibuses, or small Stage Coaches drawn by two horses, were operated there starting in the 1830s. They can be considered the original "Red Line," as they were later replaced by horse cars [c.1857], electric street cars, and of course the Cambridge-Dorchester subway. The first public conveyance from the city proper to South Boston was established by Ephraim Dodge, who, as early as 1829, commenced running a hack [small carriage], in which he conveyed passengers from the city to any part of South Boston they desired to be left, and vice versa. The route was over the old bridge that ran from Dover [East Berkeley] Street and up Fourth Street, as Broadway at that time was in no condition for carriage traffic. Later he bought another coach, and ran every hour, the fare being 12-1/2 cents. 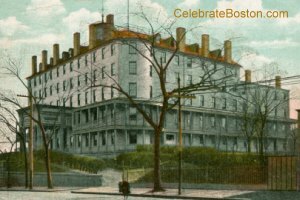 In 1838, the Mount Washington Hotel, South Boston, later occupied by the Perkins Institute for the Blind [a municipal building on East Broadway between G and H Streets stands on the site today], was opened by the Women's Association, and they commenced running a coach from the Old State House to the hotel, charging 25 cents, but this fare was reduced to 6 cents, not long after, and placed another coach on the line, and succeeded in driving Mr. Dodge out of business. About two years later, they sold the line to Samuel D. Blood, who added two omnibuses, and carried on the business until 1842, when he in turn sold out to J.C. Gibson, who soon after associated himself with Horace Hammond. This was known as the White Line, from the fact that the coaches were painted white. The line was finally merged into the Broadway and Dorchester Avenue Railroads in about 1857. Derived from a May 18, 1900 Boston Globe article. Note: Copper 1/2 cent pieces were produced by the U.S. Mint until 1857, and a 12-1/2 cent fare would be completed with these coins.